It’s no secret that sugar isn’t very good for you, but if you’re looking to cut down on the amount that you’re eating you’ll need to do more than just skip the sugar in your coffee or tea. While adding sugar to food and drinks is an issue, Statistics Canada estimates that the average Canadian consumes over 100g of sugar daily, which is 26 teaspoons a day! You’re likely not adding 26 teaspoons of sugar to everything you eat and drink so where is it coming from? Sugar that’s added to packaged food and beverages are the biggest culprits. The World Health Organization’s (WHO) most recent guidelines recommend that added sugars make up no more than10% of daily caloric intake, but are moving towards getting the amount down below 5%. So what does 10% of an average 2000-calorie diet look like? That would end up being about 12 teaspoons daily, which is less than HALF of what people are consuming on average currently. A full package of Nature Valley Oat & Honey Granola Bars contain 12 g of sugar (3 tsp), and a 100g container of Activia strawberry yoghurt contains 11g of sugar (almost 3 tsp). Eat those two products, or something similar, each day and you’ve already reached half of the WHO’s recommended daily intake. These recommendations do not include sugars that naturally occur in fruit, vegetables, or milk products. 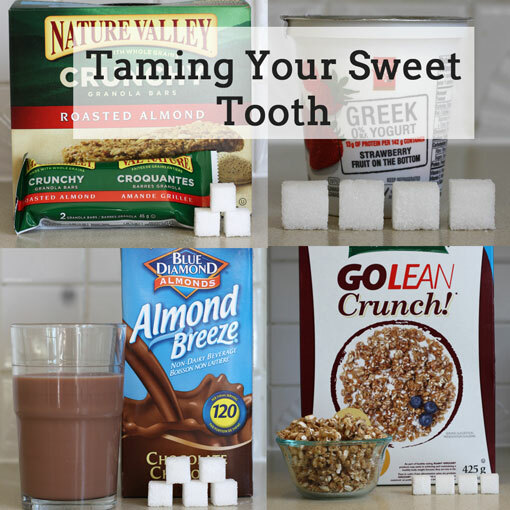 So, how do you tame your sweet tooth? Cut down your on consumption of packaged and processed foods, as added sugar is an ingredient in almost all of them. Read ingredients labels, and try to avoid products with cane juice, fruit juice concentrate, syrup, glucose, fructose (labeled as high-fructose corn syrup in the US), and most words with the “-ose” suffix. Eliminate drinks with sugar listed in the ingredients list. Drinking sugar calories is worse than eating them because you get no sense of fullness and end up consuming more. Retrain your taste buds so that you crave less sugar. While, scientifically speaking, it might be a stretch to become addicted to sugar in a clinical sense (studies have linked consuming highly processed carbohydrates to activating areas of the brain involved with addictive behavior), you do crave it and acquire a taste for it. Switching to artificial sweeteners like aspartame and sucralose (and even stevia, without the other health implications that come with chemical artificial sweeteners) may not affect your blood sugar levels, but they won’t help curb your cravings for sugar. Your taste buds will still crave sweet. Cutting back on sweet flavours over time is the only way to crave less sugar. Refined sugars can do more than increase your risk of obesity and dental decay. Sugar also has a negative impact on mood, premenstrual syndrome, and can even affect skin health by promoting premature aging and aggravating inflammatory conditions like acne, rosacea, eczema and psoriasis. If you’re ready to make some changes to the way that you eat, and change your relationship with food entirely, contact me so we can work out a program that’s designed with your needs and lifestyle in mind. Stop! Put Down That Doughnut!